Are you growing indoor cannabis plants? They need nutrients from light and water. But it’s not that simple. You’ll also need to provide the plants with enough light. LED grow lights are great, but how can you maximize your light coverage? That’s where reflector hoods come in. They maximize your grow light efficiency by ensuring 100% of the light is reflected towards your cannabis plants. It’s important for the plants not only to get light but to also the right amount, intensity, and range. Indoor plants need 12 to 16 hours of light per day based on factors like whether they’re flowering plants or seedlings. A grow light can provide enough light for your plants. However, you’ll also need to adjust the light intensity, which can range from full sunlight to full shade. I’ve reviewed some top of the line grow light hoods for exactly that purpose. 2 What Is a Grow Light Hood Used for? 5 Wing vs. Umbrella vs. Hood vs. Air-Cooled Hood/Reflectors: Which is Best? This provides more versatility since the hood reflector works with a wide range of different grow lights. It makes it easier to match up your existing lamp with a hood reflector. This is a parabolic vertical umbrella shape reflector. The hood reflector has a diameter of 42 inches (3.5 feet). This is quite large compared to other units on the market. The ceramic E39 has a bigger socket than other sockets like E26/E27. The ceramic material is effective for handling high temperatures, which is especially important with grow lights since they often run for several hours during the day. The 5-plug is an industry standard, so it’s another way the Reflector Hood provides more versatility. You won’t have to deal with adapters, which can be a hassle. In addition, the wire cord is heavy-duty, so it’s built to last. No worries about overheating or cord related fire hazards. 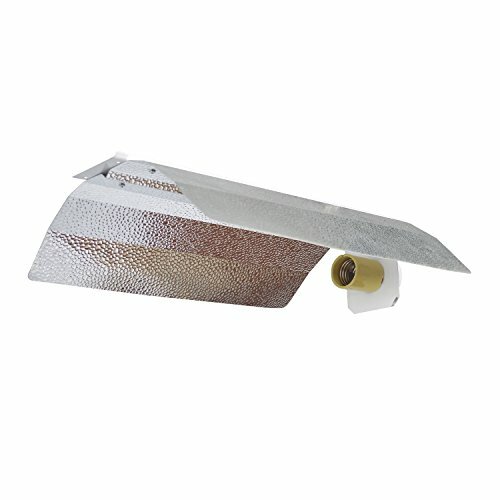 The base material of the Hydro Crunch reflector hood is reflective aluminum. This provides the durability of the metal along with the ability to reflect light and boost the intensity. The company offers a 100% money-back guarantee. If you have any problems with the product’s quality, you can contact the company. They promise to deal with any questions or problems you have. The hood reflector includes painted white panels with 95% reflective German aluminum. This boosts the lighting area and light intensity. It makes the hood reflector as efficient as possible, which is critical for indoor plants in particular since it involves artificial light. Sunrays are the best source of light for plants, but indoor plants often need artificial light. This hood reflector helps to boost the light’s intensity to help simulate the sun’s rays whether it’s daytime or nighttime. This unit helps to control the plants’ growth scientifically. It’s critical for indoor plants to get light, but you’ll want to prevent them from overheating. It won’t be a problem with this unit. The effective Air Cool guarantees that air passes through both of the reflector’s ends. This provides high incline air-cooling. Another benefit is it also prevents the plants from being exposed to high heat, which could be dangerous to them. The 15-foot heavy-duty lamp cord offers the length and durability to make it long-lasting. It also includes a standard 5-Plug for hydroponic units. This provides more versatility. Another feature is the E39 Mogul Socket. This socket is larger than others on the market. In addition, the ceramic material is effective in preventing problems related to the unit’s high temperatures. That, in turn, helps to improve the functionality and longevity of the unit. The Giantex air-cooled hood reflector is 100% sealed. It contains a fan, filter, gaskets, and duct-support. The unit also includes slide-in glass w/ gasket and V-Hanger hooks for more installation flexibility. All of these features add to the unit’s value and increase its functionality. The bracket is made of heavy-duty galvanized steel. This helps to extend its lifespan and also secure the unit better. While it’s important to boost the light’s intensity, the coverage area is also important. This unit offers light coverage up to 4×4, which is a plus over other hood reflectors with smaller coverage areas. It’s important to note the coverage is based on wattage and fixture height. One of the great things about the iPower reflector hood model is that iPower offers several variations of bulb and reflector hoods. You can use from 400w to 1000w HPS bulbs, as well as a cool hood reflector design (shown above), or a wing reflector design. The E39 mogul socket is made of ceramic and is a larger socket than the ones on other units. The ceramic material absorbs the light’s heat better, which in turn helps to prevent overheating your plants. The 10-foot lamp cord is heavy-duty and built in. This provides better results due to the durability of the unit. The cord is an important component to help ensure your unit is getting enough juice. The panels are made of highly -reflective 0.4mm-thick German aluminum. This provides a maximum 95% light reflection, which in turn will help your indoor plants to grow better. The aluminum helps to boost the lighting area and light. iPower has provided gardeners with grow light systems for more than a decade. The goal of the company is to provide all plants with light when it’s needed. iPower offers a wide range of products including HPS/MH lamps, digital ballasts, and LED/fluorescent lighting. Air goes through both of the reflector’s ends easily. This provides excellent inline air cooling, which helps to prevent your plants from overheating due to overly high temperatures. This type of hood reflects light toward the plants. A piece of glass/plastic keeps hot air close to the bulb. The term “air-cooled” is based on them being easy to connect to the exhaust system. A fan pulls the hot air from the bulbs and out of a window or other place you’re exhausting the hot air. 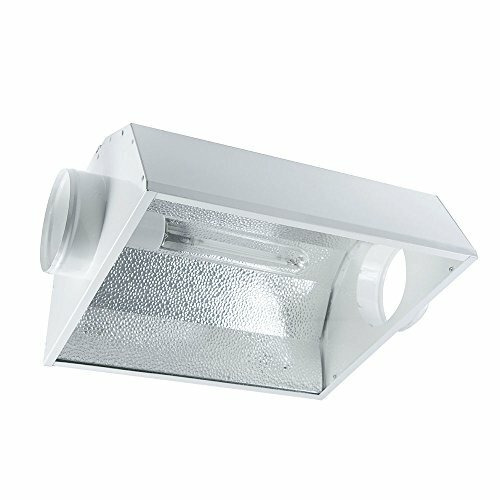 What Is a Grow Light Hood Used for? If you already have grow lights then why do you need a hood/reflector? These units are designed to work with metal halide (MH), and high-pressure sodium (HPS) grow lights. 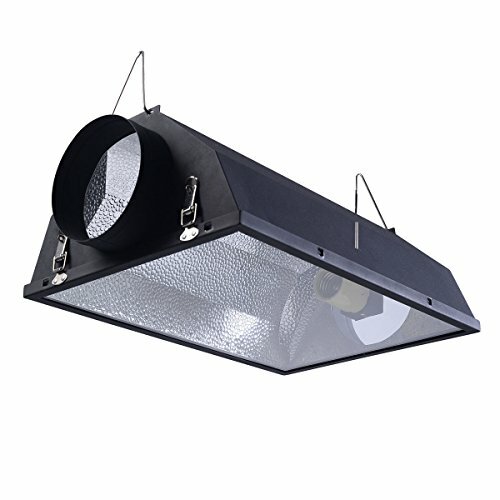 If you have a grow room, then you should definitely consider investing in grow light reflectors. They use reflective materials in order to direct grow bulbs’ omnidirectional light downwards towards your plants. This makes the lights more efficient and reduces how much light is lost. This is especially critical when growing indoor plants since you’ll want to make your light sources as efficiently as possible. A mistake newbie grows light users make in particular is not making their system as efficient as possible. If you don’t have the right hood/reflector, it can have a negative effect on your crop yield. That’s a bad thing! A big plus of grow light hoods is both newbies and experts can use them. This makes them more flexible since you won’t have to have tons of experience in order to use the units, for example. How about if you own grow lights known as compact fluorescent lights (CFL)? In that case, you’ll have to find/use a CFL reflector that’s specially designed. Various types of grow light reflectors are available. It’s important to know the basics about the different types so you can pick the best one for your wants and needs. There’s more on that later. Besides the different types, you also have different sizes and shapes to pick from like Square, Rectangular, and Parabolic. Sizes include Compact and Large. The different combinations of these shapes and sizes change the light’s footprint including intensity and area. Some examples include tight-focus, wide, and less intensity. This is another issue to consider when picking a hood/reflector. Different manufacturers use various kinds of reflective materials. There’s no “perfect” material, so each one has benefits/drawbacks. Make sure to consider these factors so you can make a good decision about the best one for your situation. Let’s get a little more specific about how hoods/reflectors work. When grow lights give off photons they travel straight until they hit something. In this case, it’s the grow light reflector’s reflective surface. The physics involved with hoods/reflectors is quite complex. The main thing is to pick a unit that reflects a high amount of light like 97%, for example. This makes it more efficient and reduces how much light has to bounce around before it hits the plants’ surface. There’s another reason a highly-efficient reflector is important. When there’s more heat energy lost it ends up in the grow room, which makes it warmer. That’s definitely a situation to avoid since it will make the area uncomfortable. If you just use your hydroponic lighting to light your indoor plants, you’d “waste” lots of light. That’s because it would bounce more than a rubber ball off walls and ceilings. This makes you grow light less effective since less light gets to the plants. It also causes higher energy bills. The longer you have to provide light for your plants, the higher your bills will be. This can be especially tough if you’re on a shoestring budget. Keep in mind your bills will also be exponentially higher based on the number of plants you have. Each one will be affected by a bad lighting system. A hood reflector not only makes sure your plants are getting light efficiently. It also helps to ensure they’re getting enough light. When there’s energy lost from an inefficient grow light system, this can affect how much light they’re actually getting. One example is flowering plants. They need 12 to 16 hours/light daily. This is based on various factors. One is the type of plant you’re growing since some plants need more light while others need less. Another factor is the efficiency of your grow lights. A hood/reflector can boost the light’s intensity and thus reduce how many hours of light they need. That provides several benefits including light that’s more intense, efficient, and affordable. Wing vs. Umbrella vs. Hood vs. Air-Cooled Hood/Reflectors: Which is Best? These are also known as ‘bat wings” and are a good option for small gardens. You can install these reflectors close to plants and they are a good option for newbies. How do they work? These units include adjustable wings that you can tweak for your grow area size. These units are usually made of flexible aluminum. A key feature of winged reflectors is you can greatly maximize the light intensity that gets to your plants. This explains why these are better than old-school reflectors on the market, which only reduce light. When using these fixtures make sure to cool the environment with air conditioners or exhausts. Take this step instead of cooling the fixture itself. These are also known as “parabolic” reflectors. They’re often used in greenhouses for supplemental lighting due to their ability to cover a wider area. This is one of the most popular types of reflectors on the market. You have two main options. Horizontal reflectors include horizontal-mounted lamps, and the light/heat are directed down to the area under the reflector. Then there are parabolic reflectors in which the lamp has a vertical mounting. This directs the heat away from your plants. A big benefit of umbrella reflectors is the plants experience less heat stress when a big area is covered. Another plus is the soil remains fresher longer, and the chance of later nutrient imbalance is less likely. When you use grow tents the light is reflected towards the plants instead of getting aimed at them. The results seem to be better than standard horizontal reflectors in terms of healthy plants and bigger yields. While “hood” and “reflector” are used somewhat interchangeably, we’re talking here about the basic hood shape. You can use this type of fixture in gardens of any size. If you’re using it in a big space, you’ll also need to use extra light sources. One of the main differences you’ll see when picking a hood is whether it’s open or closed. An open-ended hood includes wing reflectors. These are the most popular ones due to the focused light and low cost. The main drawback is there’s no system to decrease heat. As a result, you can’t place the hood close to plants, which can affect their growth. Then there are closed hoods. This provides more focused/uniform light than open-ended units. The problem is while these can be plusses, they must be lifted higher versus open-ended hoods. If there isn’t enough venting, the heat can become an issue when using high-wattage grow bulbs. This includes two main types including the air-cooled reflector. There’s also the cool-tube reflector, which is a version of the air-cooled. These are designed, so heat gets pushed past the glass at the hood’s bottom. These units also have venting holes located on the sides, which can connect to exhaust ducts. Like other types of systems, there are pros and cons. In particular, you can control the light focus and heat, and place the reflectors close to plants without them getting burned. How about drawbacks? The main one is air-cooled reflectors need to be maintained regularly. You must clean the reflectors/glass much more often, so the light output isn’t decreased. Another drawback is the unit’s glass panel is able to filter out UV lights, which can be helpful to plants. The bottom line Is air-cooled reflectors are one of the best options for enclosed spaces and grow tents. Just be ready to shell out more money since this is the most expensive type of grow light reflector on the market. There’s no question a hood reflector can make your grow light more efficient. It does this by making the light more focused so more hits the plant. Fewer rays bounce around and end up heating up the grow room. The key is to pick one that best suits the plants, lighting, and system you have. Let’s get to the nitty-gritty. The unit has everything you need for an efficient reflector. That includes the fan, filter, and gaskets. The unit is constructed from sturdy German aluminum with white-painted panels. The hood/reflector also includes components that add value. They include E39 Mogul Socket and hydroponic 5-plug. These are important features since they boost the unit’s functionality and flexibility. The ceramic socket absorbs heat better than other materials, which is critical for long-term use. The unit is also efficient with Duct Air, which provides efficient inline air cooling and prevents excess heat. Finally, there’s a satisfaction guarantee provided. This helps to protect your hood/reflector, investment, and plants!